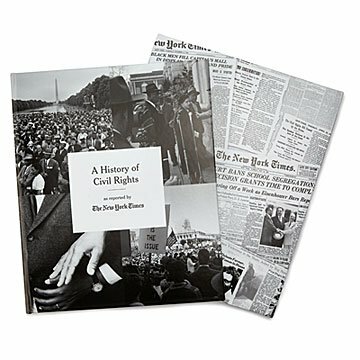 Through the eyes of the NYT, this book tells the stories of those who dared to stand for civil rights. From Abraham Lincoln's Emancipation Proclamation to the symbolic kneeling of NFL players during the National Anthem, the history of civil rights is one of remarkable struggle and hard-fought strides. Through a collection of New York Times articles, this coffee table book tells the stories of those who dared to stand (or kneel) for equality. The cover features several powerful images, including one of mourners at the Rev. Dr. Martin Luther King Jr.'s funeral. In her introduction for the book, Pulitzer Prize-winning Times reporter Dana Canedy writes about the leader's iconic "I have a dream" speech: "Times writer James Reston, probably realizing he had just heard a speech for the ages, wrote about the march, 'It will be a long time before it forgets the melodious and melancholy voice of the Rev. Dr. Martin Luther King Jr. crying out his dreams to the multitude." Made in Williston, Vermont. $5 from the purchase of this book goes to Black Girls Code, a non-profit organization that teaches computer programming and technology to girls of color. Also check out A History of Gay Rights and Women Making History.